Jon’s background is in theatre. After training for 3 years at the Bristol Old Vic Theatre School, he worked professionally for over 9 years as an actor and musician in theatres throughout the whole of the UK and Europe. Shows he performed in include, ‘Return to the Forbidden Planet’, ‘Blood Brothers’, ‘Murder at the Vicarage’, ‘Macbeth’, ‘Henry IV’ as well as three pantomimes. Jon lives near Bristol with his wife Debbie and their 3 children. 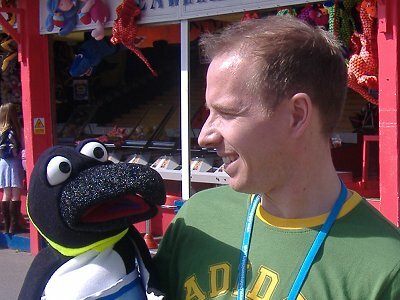 Involved in children’s ministry since 1998, September 2003 saw him become full time in evangelism communicating the gospel through entertainment, drama, illusion and music, bringing fun and laughter to children and adults alike. Aiming to meet your needs, Jon’s experience and background in performing will truly bring ‘quality’ to your event. He is a registered member of ‘Equity’ (which includes public liability insurance) is an associate evangelist with Open Air Campaigners and also belongs to the Fellowship of Christian Magicians UK. He has led the All-age Celebration meetings at both Spring Harvest sites since 2007 and also contributed songs to their ‘Kids Praise Party’ Music Books and albums. "We have been impressed by the way the team worked so hard & well together, but especially by Jon’s quiet, accessible authority – really captivating and drawing us into the truth." What Jon will aim to do is to tailor his presentation to meet YOUR needs. What is the audience you want to reach? What is the purpose of your event? Is this event the start of an outreach initiative or as the ending presentation to a community /church project? Although Jon can use many ideas and resources to share the love of Jesus, he wants to help deliver the message God has laid on your heart for your situation and community. His goal is to see children, young people, believers and those searching for ‘life’, finding truth through a living relationship with Jesus Christ. "My 6 year old says she is going to be a fan of Jesus now thanks to Jon and the team"